I am sure it must be cauliflower from outer space. I have seen these, I think, in the UK? in the Farmers Markets? Can't wait to hear what it is. This is an amazing looking photo.. It looks like purple lettuce..not sure! Hi Suganya!! I think its purple lettuce. Looks like some kind of red lettuce to me. We have those in green here, don't know what they are called but they are from France, a veg similar to Cauliflower I think!! My guess is cauliflower :)! 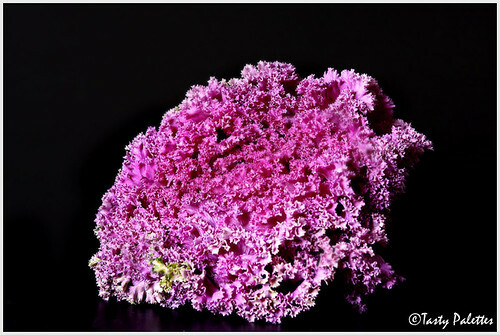 Is it red/ purple kale ? I am a little confident I am close to correct. I think it is kale. I made apple turnovers as per your recipe and they turned out pretty neat. Thanks. You have a good blog with fantastic pictures and a good mix of recipes. Keep up the good work. its a green, i have seen in american stores.. kohlrabi ? It's very, VERY pretty Suganya! Is it some sort of a fungus which the chinese use in their cooking?